I love candy corn. I have candy corn tattoos, candy corn scented candles, I draw candy corn (poorly), I also eat the heck out of some candy corn. So why not make a candy corn cupcake? I wonder how many times I can say candy corn in one post? These guys are so easy to make, So get your festive candy corn hats on (please tell me I'm not the only one who has one) and bake a batch today! Preheat oven to 350 F. Line muffin pan with cupcake liners. Spray lightly with cooking spray.Whisk together the flour, cornstarch, baking powder, baking soda, and salt into a large bowl. Whisk the soy milk and vinegar in a small bowl and set aside to curdle, about 10 minutes.Beat together the soy milk mixture, oil, sugar, and vanilla extract in a large bowl.Mix in the dry mixture, and fold gently until no large lumps remain. Divide batter into two medium sized bowls. Add a little glob of yellow into one bowl, and orange in another. Mix until you have reached your desired color. Now it's time to fill your liners, please dont do what I did and mess up your candy corn colors. It was 4 am and I was tired.. 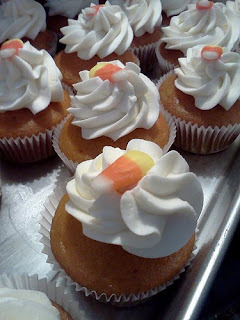 Guess who had to make 2 dozen candy corn cupcakes all over again? Yep.. This gal! Start off with the yellow, then add the orange. Bake at 350 for 20-22 minutes or until toothpick inserted in center comes out clean. Cool completely before frosting. For the frosting, beat together the butter and shortening until nice and fluffy, slowly add the powdered sugar a cup at a time, until creamy. If needed add soymilk. Finally beat in vanilla and frosting cupcakes as desired. Top off with a candy corn, or pipe on a cute little decoration. Happy baking!